It is one thing to be asked to pray for another person. I'm happy to do it. I want to do it. I must admit, though, I am not always faithful to do it. However, it is another thing to be told what to ask God for in the situation. 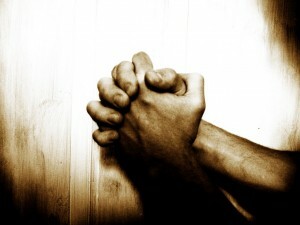 I've noticed that often requests for prayer come with specific instructions on how to pray. I call it a “please pray for my predetermined positive outcome” request. And while I'm questioning our accepted methods of requesting prayer, I've got to ask, why do we seem to make it our goal to get as many people as possible praying toward our predetermined positive outcome? Is it that we think God is resistant to doing what is good and right but can be pressured by a large number of people to relent and deliver? Do we think that the more people we recruit to pray for the same thing will prove our sincerity or improve our odds? I suppose I really began to think about these things during the season in which we were caring for our daughter, Hope, who was born with a fatal genetic disorder. I remember getting a call from the secretary at our church. “We've put you on the prayer list,” she said, “and we're asking people to pray that God will do a miracle and heal Hope.” Honestly it was a little awkward to tell her that while that was fine, it wasn't the way we were praying. Our reluctance to pray in this way had nothing to do with whether or not we thought God is powerful enough to do that kind of miracle. This is the God who spoke the world into being. No question he could do it. So how were praying for Hope? I wish I could tell you that I was a great woman of prayer in those difficult days. Truth is, I wasn't. I was really grateful that so many people were praying for us, no matter what they were praying, because I didn't have many words, mostly just groans and tears. I was grateful to know that the Holy Spirit was interceding for us with “groanings too deep for words” (Romans 8:36). When I was able to sputter out a prayer, it was shaped most profoundly by something a friend said to me on the phone a couple of days after Hope was born. She said that I could be confident that God would accomplish the purpose he had for Hope's life in the number of days that he gave to her. So in my prayers I began to welcome him to accomplish that purpose. I prayed that my own sin and selfishness and small agendas would not hinder his purpose. I prayed that that his purpose for Hope's life would be enough for me, even a joy to me. What would happen if we allowed Scripture to provide the outcomes we prayed toward? What if we expanded our prayers from praying solely for healing and deliverance and success to praying that God would use the suffering and disappointment and dead ends in our lives to accomplish the purposes he has set forth in Scripture? Scripture provides us with a vocabulary for expanding our prayers for hurting people far beyond our predetermined positive outcomes. Instead of praying only for relief, we begin to pray that the glory of God's character would be on display in our lives and the lives of those for whom we are praying. We pray for the joy of discovering that the faith we have given lip service to over a lifetime is the real deal. We ask God to use the difficulty to make us less self-reliant and more God-reliant. Rather than only begging him to remove the suffering in our loved ones' lives, we ask him to make them spiritually fruitful in the midst of suffering he chooses not to remove. The Westminster Shorter Catechism for Young Children asks the question, what is prayer? The answer: “Prayer is asking God for things which he has promised to give.” Are we praying for things God has promised to give—like his presence with us, his Word guiding us, his power working in us, his purpose accomplished through us? Or are we limited to praying only for what he has not promised to give—complete physical healing and wholeness in the here and now? To go deeper than praying only for deliverance means that we approach prayer not as a tool to manipulate God to get what we want, but as a way to submit to what he wants. Through prayer we draw close to him in our need. We tell him that we will not insist on our predetermined positive outcome but want to welcome him to have his way, accomplish his purpose.